Have you ever wondered if there were some tips and tricks that the bug guys have for keeping pests to a minimum? We polled the pest technicians around the office and came up with a Top 5 list! 1. Cleaning Before a Service? You don’t have to pick up your home before your pest tech comes to service the inside of your home. We can treat around the major furniture of your home. AND as always, the products we use in and around your home are safe for your kids and pets! Keep bushes and tree limbs at least 6 inches away from your home. An overhanging limb or a bush right next to an outside wall creates a “highway” for an insect or rodent to get easy access to the inside warmth of your home! 3. Keep those gutters clean! Even if you have fancy guards over them, pine needles and other debris can make its way into your gutters. Most insects thrive in moisture rich environments. By cleaning out your gutters on a regular basis, your are taking away the insects’ and bugs’ food source and breeding area (mosquitoes). Next time it’s raining, go outside and see where the water is running around your house. Is the water headed straight for your home? Around 60% of homeowners have some sort of water issue in their yard. If you happen to be a part of that unlucky group, you should address some of your drainage issues. It may require some simple landscaping changes or some more complicated in-ground drainage installations. If you have water pooling around your home, it is creating the perfect breeding grounds for mosquitoes and other insects and it is a problem that needs to be taken care of! Pine straw and mulch are a great (and inexpensive) way to dress-up the outside of your home. But did you know that you may be attracting more insects to your home with this pretty decor? It is a ground insulator and it makes a great home for insects to hide in. So, what do you do? Don’t worry, you don’t have to get rid of the mulch, just follow these 2 simple steps. Layer the pine straw 2-3 inches deep and even thinner for mulches. Keep it about a foot away from your house. Otherwise you are creating another “highway” for those insects to cross into your home. Also, remember, if you have termite bait stations around your home, don’t cover them up! We know it’s tempting to hide them with flowers or pine straw, but leaving them uncovered makes it much easier for your pest technician to find! So, there you have it, straight from our pest technicians to you! 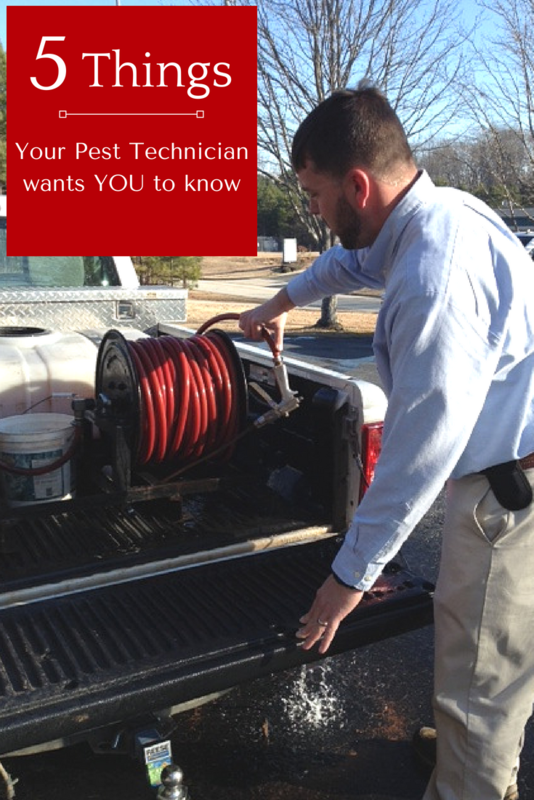 If you have questions or concerns, ask your pest technician. We love solving problems and making customers happy! If you are interested in our Quarterly Pest Control Services or our Termite Treatments give us a call at 770-962-4240. I like that you mentioned to trim your hedges and bushes six inches away from the home so they don’t provide a good access point for pests. I have been struggling with pests in my home, and I want to make sure I do everything I can to get rid of them. I will be sure to trim my bushes back and see if that helps at all. Every little bit helps, Ernest! Hope this will give you a little relief from the unwanted visitors! I’m sure it’s super difficult as a specialist to come into a home with stuff everywhere and be able to efficiently spray the house. I never thought of some of these little things that can make such a big difference. I appreciate that you point out that it isn’t necessary to move anything around before the technician comes. My wife and I have noticed a bunch of spiders lately in our house and wanted to hire a company to help us with it. I’ll have to remember this when they do come. Nice tips! I totally agree that cleaning gutters on time is very important in pest control. I am moving to a new house soon and will make sure I do everything correctly before I invite a pest control technician to my house. The new home that my fiance and I moved into is having problems with bugs and we are considering calling a pest control service. It is really helpful to learn that by keeping the gutters clean means keeping bugs out. This is something we will implement more strictly when we are rid of this problem. I really like that you mentioned how draining the water in the backyard can prevent mosquitoes and other bugs from breeding! We’ve been having a pest problem at my home, and it rains a lot here. Perhaps all the water in the backyard is exactly where they’re all coming from! Thanks for the tip, I’ll be sure to make sure to drain the water in my backyard next time it rains! I appreciate all the information on what a pest technician wants you to know. It is really interesting how you do not have to clean up your home or spray your walls before they come. With that being said, I think that it would be a great time to have a technician come to our home since we have been seeing a lot of spiders find their way inside. Thanks again! Thanks for your tip to make sure that you only use products that are safe for people and pets in your house. I like how you said that cleaning your gutters and making sure you don’t have large plants outside of your house are a couple of precautionary steps that you can do yourself before you hire a professional. My husband and I are considering hiring pest control specialists to help make sure that we don’t have any rodents or ability for them to enter into our home as well. Glad that we could provide some useful information for you! My sister just moved to her new house and it has a lot of pests because it was an old house. My mom suggested having pest control service to exterminate them and shared this article with her. It says that she should keep the gutters clean. I liked that you had mentioned that it can be important to clean prior to the service to make sure everything can be treated properly. My wife and I have noticed that our mouse problem is only getting worse and neither of us really knows what to do to control the problem. We’ll have to start cleaning our home and looking into a pest control company that can come make sure we can rid all the problems. If you take a minute to look around the outside of your home, you may be able to see where they are coming in. Mice can squeeze into an opening about the size of a dime. If you still need help after inspecting your home, give us a call & we’d be happy to help you out! I like that you mention keeping your gutters clean because insects tend to thrive in those wet environments. Now that it’s winter, I’m less worried about insects, but I do want to hire a pest control company to help protect my home against rodents. It’s important to me that I hire someone who I can trust to get the job done quickly. I really like what you had to say here about how to prepare for a pest control visit. Just like you said, pruning the bushes is good to do before being visited by the technician since he will be able to more effectively spray. I think we will contact a pest control company since we have been seeing spiders lately. Thanks again! I liked that you had mentioned that it can be important to clean your home before having a pest control professional out to your home to avoid potential problems. My wife and I have been wanting to get rid of all the bugs in our home early this year and we haven’t been sure where to start. We’ll have to clean up our home and then we’ll start looking into hiring a pest control company that can help take care of everything. I do like how you mentioned that when it comes to hedges it would be wise to have them more than 6 inches away from the home to make sure that there won’t be an easy access for rodents to get in our home. That is something I will be sure to keep in mind and have our’s relocated as I did notice a rat last night in our living room. Lessening their access points should help keep them out. Additionally, I’ll be sure to get some rodent control keep those hiding inside evicted from the premise. Thanks! Thanks for the pest control tips. I had no idea that having dirty gutters could attract bugs and things. We haven’t cleaned our gutters in forever, so maybe that’s where the flies and mosquitoes are coming from. My wife and I just moved to a new home but found that our basement is full of ants. I had no idea that cleaning our your gutters could keep bugs away because it’s a breeding ground for them. We’ll have to focus on cleaning out our gutters and drains outside to see if it helps. It’s good to know that pest control products are always safe for kids and pets. I was worried about this. I want to hire someone to help get rid of my ants. I know they will be putting products in my home and I don’t want it to be a problem for my dog. I never thought about the bushes and trees that touch our home! I will make sure to trim those immediately back! I think we might have a termite problem already but would this help? No, trimming bushes won’t stop termites. The only thing that can stop them is good old fashined chemical. I’m looking at hiring a pest control company to come spray my home next month. I appreciate how you suggest cleaning the gutters of my home to help keep pests from returning. I’ll be sure to do this to allow for my spraying to be as effective as possible. Thank you for mentioning that we don’t need to clean before pest control comes. I have always thought that this would be something that would end up helping them out, but I’m glad it’s one less thing on my mind. I will probably still clean before they come over, but it’s nice to know that it won’t be the end of the world if it’s a little dirty. I like how you suggested keeping your trees and hedges at least 6 inches away from your home. My mom had to call pest control because a bunch of mice had gotten into her roof through a tree branch. Thank you for the information on what a pest control tech wants you to know. I appreciate you helping me learn more about pest control. The most important information that I’ve noticed here is that there is no need for cleaning before the pest control technician arrives. I thought we need to clean up the mess first, thanks for enlightening me with this. Thanks for these prevention tips for pests. I’m glad you mentioned that it’s important to make sure the drainage in your yard is done effectively to prevent mosquitoes. I’m kind of interested to learn if there’s a way you can test the drainage in your yard to get an idea of what could be fixed. I’ve been worried about pests this summer, so thank you for the great tips.